Develop ACNS website applications and content (C#.NET, SQL). Customize the Canvas learning management system interface, develop Canvas data load and management applications, and created the Canvas support website. Customized the RamCT Blackboard interface and help website, and upgraded snapshot clients. 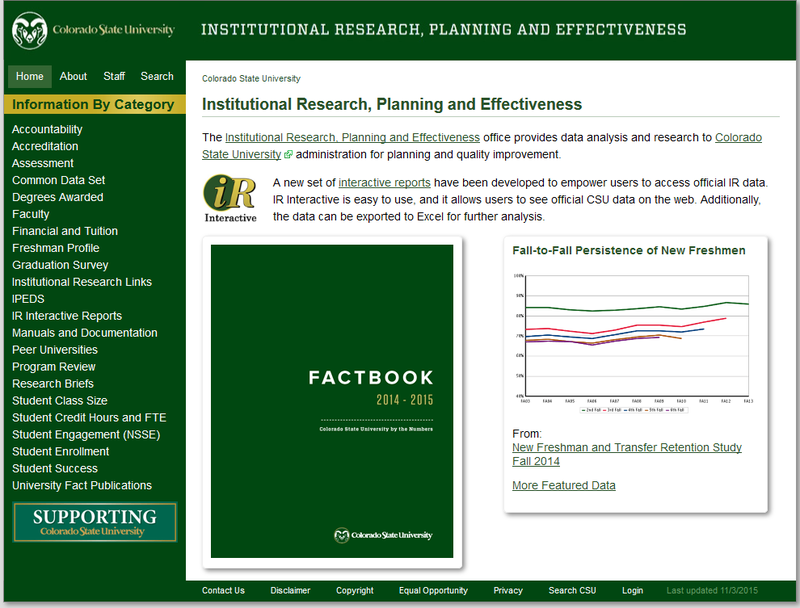 Redesigned the 4000-page Institutional Research website. Created Echo360 account and course request form and help website (C#.NET, SQL, WCF). Created a Shibboleth service provider metadata form and console app (C#.NET, SQL). Developed a directory of CSU mobile applications (jQuery Mobile). Improved web access for mobile devices on several ACNS and Libraries sites (using CSS). Continue to develop and manage the Colorado State University Libraries website and related applications (see the Web Coordinator description).